Learning is done in achieving the competency of prospective shipper or expedition in the stuffing process in container media owned by the Yogyakarta Maritime Academy in the Department of Commercial Shipping Management. The purpose of this paper is to achieve competence or with the term completeness in the process of forming prospective operational parts in the warehouse of exporters who are capable of stuffing. 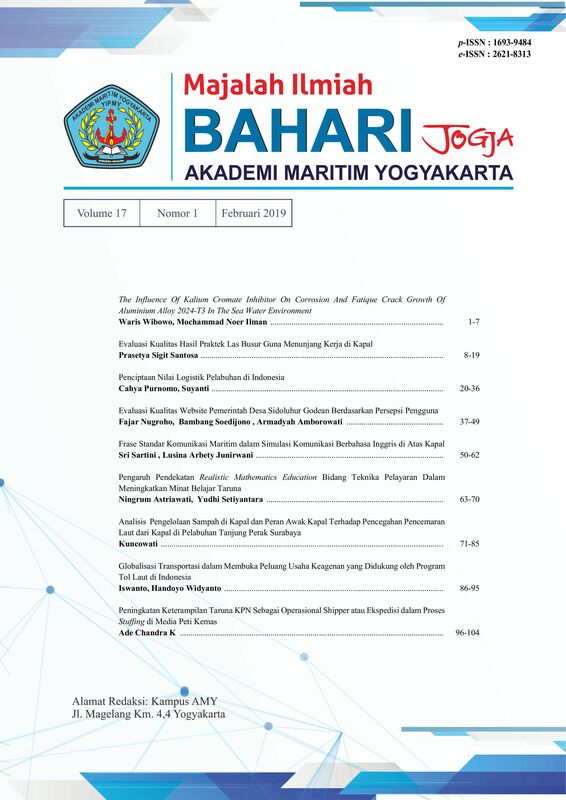 The method used was in the form of a role play stuffing process by the three-semester level cadets in learning Load and Stacking Management in container media owned by the Yogyakarta Maritime Academy. The strategies in learning that are applied are learning planning, organizing, actuating, and controlling scenarios. The results achieved to realize a professional workforce in the field of shipping, especially in the field of commercial shipping management for prospective loading and unloading operations that will work in the warehouse exporter. After learning in the form of role play, the ability of the shipper's operational and expedition is produced which handles the cargo in the stuffing process.